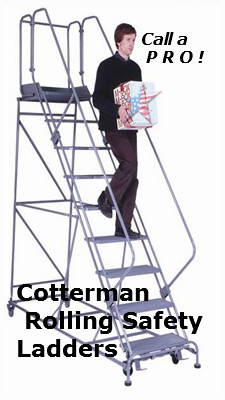 Cotterman Rolling Safety Ladder Series 1500 has a 450lb. Load Capacity, Powder Coat Paint Finish, Ships Partially Assembled! 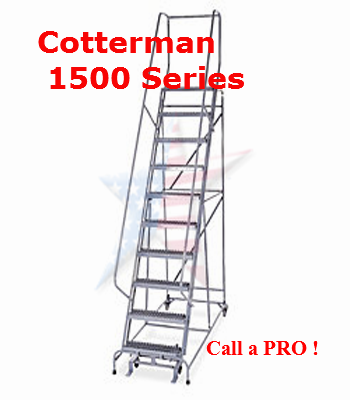 1500 Series, Cotterman Ladders. This is the assembled version of our 1000 series unassembled. Packaged for shipping at a lower freight class the ladders require approx. 15 – 30 minutes to assemble, depending on size. This series has the most selection of all of our products, ranging from three to nineteen steps. 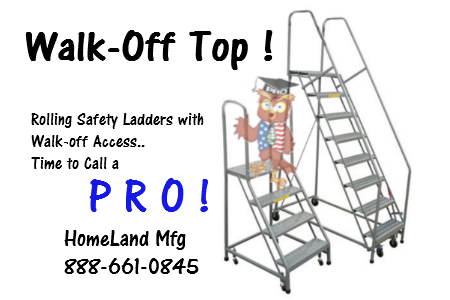 Ladders with 10" deep top steps ship enclosed in shrink wrap, up to 11 steps. Twelve step and taller are shipped knocked-down on skids. The ladder is powder coated with high gloss powder. Pick your color from our 11 stock choices. The steps are 7" deep, with the top step being your choice of 10, 20, or 30" Tread selections are Performa tread for highest slip resistance, expanded metal mesh or Grip Strut for heavy industrial environments. The load rating is 450lbs. One through four step ladders have spring loaded casters that retract whenever weight is applied, immobilizing the ladder. Five step and up have our Safelock system. **Specify Set Up (SU) Model or Knocked Down (KN) Model for Freight Savings! Knocked-down design features included step by step assembly instructions. * Denotes models WITHOUT handrails. These listed here are EXPANDED METAL TREAD. * Denotes models WITHOUT handrails.